I know there are quite a few who do not like the new First livery, (I am a fan!) but many agree that it does sit really well on the Plaxton Pointer Darts. First Devon have surprised us with their most recent repaint as its 424673 R463CCV one of the older buses in the new scheme. It is also a surprise (disappointment?) to see the DEVON names back in use rather than something more local. It is a shame that Torpoint and Tavistock get their own names but Plymouth does not. That said, if we get a few more buses repainted like this it is going to be welcomed by many as the fleet has been looking down at heel recently compared with a few years ago. Due to a large vehicle unloading in the road we are currently unable to serve fletemoor road and the top of bridwell road. Easter Bus Services: Time for a Review? Sunday services on Bank Holidays have become the "norm" in recent years but The Man on the Lancaster Omnibus wonders whether they are always appropriate Good Friday is now, for many people, equivalent to a Saturday. They are not at work, the kids are not at school but the shops, pubs, cinemas etc are all open and, of course, the beaches, Lakes and hills are all still there. So should the bus service be. From Surf to Star . We may complain; indeed we are right to complain, about the decline in rural transport in UK. BUT, we still have the privilege of, probably, the best rural bus network in Europe (if not the world! ), perhaps with the exception of the Netherlands We Could Have Done It - Yesterday. Today, fbb and Mrs are travelling by car from their Devon Estate to share a few days with the family in Abegynolwyn, Wales. Cat sitting arrangements as usual! We Could Have Done It - On Friday The fbb's travelled by car yesterday from East Devon to Abergynolwyn; but, in theory at least, this complex cross country journey is possible all the way by public transport From Surf to Star  Once again we are faced with the usual debate. Which is better; the French highly subsidised system with poor coverage in rural areas OR the UK hotch-potch of commercial and tendered routes, the latter at the mercy of cash-strapped local authorities, the former serving share holders first and the public second. Too difficult a choice to resolve? More Consultation on Nexus Quality Contracts Scheme Nexus has opened a short period of supplemental consultation as it moves to complete a proposal for the UK’s first bus Quality Contracts Scheme. Edinburgh Trams Being Delayed A city’s tram network was brought to a standstill after a taxi driver parked her car on tracks and went to get a McDonald’s breakfast. Angry passengers were kept waiting for ten minutes when the peckish driver stopped to get a morning snack in Edinburgh. UK Coach Awards 2014 The 6th annual UK Coach Awards were held at the Piccadilly Hotel Manchester on Thursday 10 April. 94% of Supertram Customers Satisfied With Service The results of the Passenger Focus survey, show that 94% of tram customers in Sheffield were either very or fairly satisfied with their overall service. No Supertram passengers surveyed said they were dissatisfied overall. 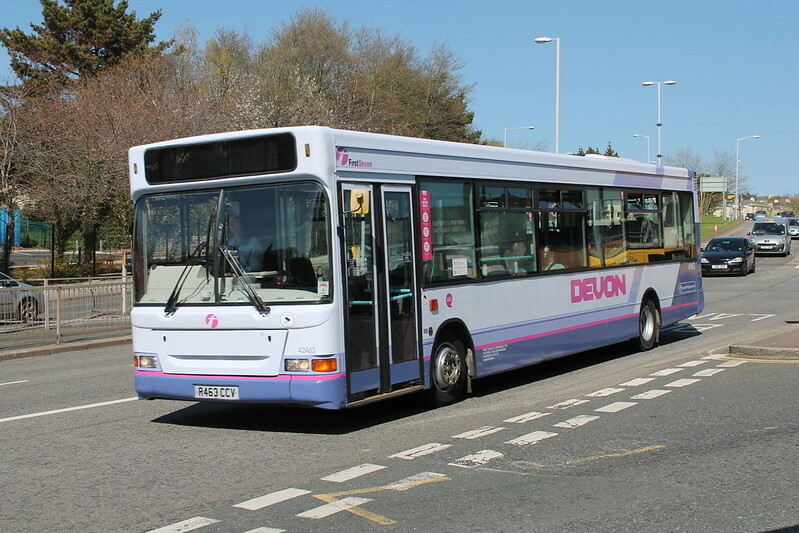 This bus isn't staying in Plymouth, hence 'Devon'. Plymouth is back to painting for Buses of Somerset. One Trident gone back to them from paint and another four to be painted next. All from First Glasgow. I have to agree the exterior looks smart - is the interior reasonably presentable ? Are the Marshall Darts 41291 T291JLD & 41295 that were repainted back in 2012 still in service ? Not sure that this looks good for fleet replacement for Plymouth- as was pointed out above, a lot of other areas are scrapping darts of this age. It's only an emergency temporary contract. Who else would be able to cover it at short notice? And who else might bid for the long-term contract? At least they might be able to bump the price up. As for fares, do the changes indicate that they're 'winning' or that that they got them spectacularly wrong? I think the general belief by those in the know is that it indicates that First have truly decided that they want to have a healthy business there, that they have people in there now who know how to turn it round and more than that who have a massive track record in dealing with competition. Whatever has happened at First there, or not happened, they have finally woken up and decided to come out fighting. Webbers hasn't got anywhere else to go because they already compete with First on all its routes worth running, Read the local press about the 27 too and you can see that Webbers has a terrible reputation for reliability. Their buses are a mixture of all sorts of colours, they don't produce timetables leaflets any more even though SCC don't produce a book either. First now has a cracking new website, brilliant timetable booklet, posters appearing everywhere promoting its fares and unlike Webberbus who don't do roadside, I've seen timetable cases going up all along the 21 in the past few weeks. The two advantages tWebbers had were new leased buses, but First looks like it will continue to push more decent buses into Buses of Somerset, and lower prices. Now the lower price advantage has been blown away too. First is getting there with reliability, not perfect but looking at their facebook pages better than Webbers now. For a long while everyone was just waiting to hear that Webbers had finally been bought by RATP who were expecting First to leave town. Presumably Webbers plan was to expand then sell up. Now it looks like First are there to stay and what's more the Buses of Somerset project looks like a real challenge to Webbers local image. First have people there who know what they are doing and even more who probably want to show they know what they are doing too so will go all out to make Buses of Somerset a real industry example of how to turn round an underperforming bus company.. Nowhere else for Webberbus to go, no one to sell up to, no Park and Ride contract, no advantage on fares. I know where my money would be! No other local operators would be in a position to bid for an 8 bus contract - evidently Webberbus will not be given a look in and Stagecoach can't resource it - all other local operators go for 1/2 bus contracts. Tuesday 22nd - Noticed that First are using brand new Wright buses on the Taunton P&R - believer they are registered to First Devon & Cornwall, Plymouth. Difficult to see how Webberbus can adjust to the loss of a second large contract in 15 months, this will affect their cash flow drastically. All for want of proper operational supervision. Running an expensive, leased fleet means cash must be coming in to pay for it - a problem First doesn't have, with a fully depreciated fleet that only costs them on maintenance. I'm not sure First has a fully depreciated fleet, but more importantly First certainly it is a business that can withstand its costs in the short term in a battle with Webberbus. The question is only whether Webberbus can stand a massive fight back from First. On vehicles First is planning on sending newer vehicles in there I believe. I expect that the fare cuts are only one action in a much bigger fight. The most relevant question is whether the local market can support two bus operators competing on just about the whole network. It's doubtful either of them makes much if any money now looking at the passenger numbers on their buses. They used to look pretty even but Buses of Somerset/First just look to be getting that edge now. If the fares shift customers by only a smallish amount I can't see Webberbus being able to survive. It looks like we're watching a more interesting battle here than in Plymouth!!! In the past I would have said that Webberbus should be able to win and that on First's old performance and lack of attention or effort Webberbus would deserve to. Now looking at the disarray at Webberbus and the way in which First are doing what they are so well and so professionally as Buses of Somerset, then if only one of them survives I hope it's First! It might be incorrect of me to say First's fleet is fully depreciated, but it will have a lower book value than that of other companies. First's Plymouth fleet and their Somerset fleet is made up of older buses, cascaded from elsewhere which have a lower value. This does mean it does not have the capital costs of the newer vehicles, but it does have to invest in maintenance. All buses have to undergo the equivalent of a MOT every 4 to 6 weeks so they will be in much better mechanical state than most private cars. This comment will no doubt bring the usual comment about First's 'crocks' and their condition, but the fact remains, it's going to be of a decent standard, if not VOSA will be calling the company to account and it will be public knowledge. First has mis-managed the West Country for over 10 years, and the 'local' identities are a very important part of that process in reversing the losses to other operators. Fair play to Webberbus for spotting an opportunity to grow and develop a viable bus operation with quality vehicles. Sadly it too has suffered in the last 18 months with a resurgent First and has perhaps spread itself too thinly to operate a decent service, and it has failed to capitalise on it's opportunities and get firmly established on its key service which it started operating in 2008. The loss of 2 contracts which make around 40% of its bus output raise wider questions about Webberbus' ability to operate sizeable contracts longer term, and the loss of these contracts means the leased fleet still needs to be paid for every month, but now that cost has to be found from commercial services which First is fighting back on. It is an interesting question whether Webberbus can make enough money from those routes to pay for these buses, which have to paid for each month because they are on lease. It is reasonably well known Webbers sometimes make their employees wait for their wages, which would hint at cash flow issues - clearly some bills are prioritised ahead of others. They struggle to recruit staff, unsurprisingly. First have the deeper pockets in Somerset, and in Plymouth they can maintain their service levels for as long as they wish, meaning Go Ahead has a harder battle to fight than in a traditional David vs Goliath bus war. First is not just going to go away. Except I don't think Wesretn Greyhound have Webberbus's problem or unreliable or unpunctual running - or are standards there beginning to slip? Since when have First been trying to kill off Western Greyhound? Western Greyhound is doing, and has been doing for the last 10 years, a very good job of killing itself. You can go back 10+ years to a number of ill conceived decisions, all of which are coming to firmly roost now. Continual investment in Varios, after the DDA deadline, all of which are scrap at the end of this year, instead of proper planning and buying DDA compliant low floor buses as the business expanded from 2001 onwards when such buses were available on the market is but one of these ill thought decisions. There's been no development of a network aside from it's tendered one, which has now left it vulnerable to other operators who can source low floor buses cheaply via internal cascade, unlike WGL which has to go to market again to replace 40 buses all at once. Another cost to be borne at a time when there's no money around. Someone like Mark Howarth is meant to be a time served, experienced busman, and as his often repeated reputation should imply, busman aware of market changes and fluctuations and experienced at managing them in order to develop and sustain a decent business. Sounds very much like someone has been found out. Yet people continue to believe WGL is an excellent business, it's in truth no better or no worse than most other operators. It's reliability can be appalling, drivers missing trips on tightly scheduled workings when they get too late to cover short town trips. It is all very good to blame traffic, yet at the same time, do nothing to address the issues it causes, year in year out, yet that is one of the essential things that can make for a successful company - and reverse the decline in people catching buses. WGL in truth faces the same issues as other bus companies, who do plan properly for the problems that occur and ensure that they provide reliable services for the customers. If First focused on some basic things, they could do WGL some serious damage. They do of course know this - what next a 'Buses of Cornwall' identity and new local empowerment? I'm not sure there is a battle between WGL and First. they may overlap a bit, especially around Truro, but look at them on a map and they have their own home territories. I'm not sure that they even bid against each other for the majority of the tenders. looking at First it just looks like they have won all the other tenders in their own patch, sorted out their fares, presumably with better concessionary fares payments as a result and now kept all their West Cornwall tenders. The big question is at what price. All the talk in Cornwall CC is about how much extra the tenders are costing them and that seems to be First winning at much higher prices. If First has done all of that then they don't need to damage WGL. If WGL has lost lots of its tenders in west cornwall to other operators or because Cornwall have refused to pay for the odd journeys here and there that WGL has always used to get tender money, then WGL must be struggling. So First may be on the up and WGL in the doldrums but the two aren't connected. One thing in common for Western greyhound and Webberbus? RATP had or have an option to buy them both? Both lost their sale and exit route????? RATP only operates and acquires businesses in large conurbations, not rural counties - so it would very unlikely for them to deviate from that policy and purchase two small companies in an area that is rural with not much potential for growth. Yes, but how many buses worth of work have they lost to withdrawn tenders and other operators (not just First) in their home patch of West Cornwall. And if they have done well why is Mr Howarth having a strop? Is it true that First bid separately for the Plymouth run tenders and the Cornwall run tenders? Perhaps they wanted one lot more than the other? They have the local empowerment. No longer part of the huge First South West region. Mr Carter and his Wing Man running just Devon Cornwall and Somerset now. I see that Taunton and Bridgwater have been given the green light by the traffic Commissioner to go into the First Devon and Cornwall operators licence too. Nice and tidy.